1. 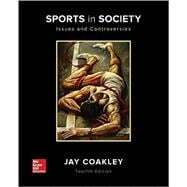 The Sociology of Sport: What Is It and Why Study It? 2. Producing Knowledge About Sports in Society: How is Knowledge Produced In the Sociology of Sport? 3. Sports and Socialization: Who Plays and What Happens to Them? 4. Sports for Children: Are Organized Programs Worth the Effort? 5. Deviance In Sports: Is It Out of Control? 6. Violence in Sports: How Does It Affect Our Lives? 7. Gender and Sports: Is Equity Possible? 8. Race and Ethnicity: Are They Important in Sports? 9. Social Class: Do Money and Power Matter in Sports? 10. Age and Ability: Barriers to Participation and Inclusion? 11.Sports and the Economy: What Are the Characteristics of Commercial Sports? 12.Sports and the Media: Could They Survive Without Each Other? 13.Sports and Politics: How Do Governments and Global Political Processes Influence Sports? 14.Sports in High School and College: Do Competitive Sports Contribute to Education? 15.Sports and Religions: Is It a Promising Combination? 16.Sports in the Future: What Do We Want Them to Be?